Linn Andrea Olsen came over to the UK from Norway to study the BSc Honours Veterinary Nursing Degree with Middlesex University in 2014. Why did you choose to study with Middlesex University / The College of Animal Welfare? When I started to research schools in the UK that offered a veterinary nursing course, The College of Animal Welfare (CAW) was one of the first to pop up. They had lots of good reviews and satisfied international students, something that is very important to me as we face some additional challenges not being from the UK. As veterinary nursing in Norway has so far only been a two year course, I was drawn by the fact that the veterinary nursing course from Middlesex University/CAW has three years, giving me a bachelor degree at the end. This will hopefully be of good use when searching for a job once I have graduated as a graduation statement from the UK is often highly valued due to the UK’s excellent educational reputation. This course also has a very large percentage of nursing practice every year where the students are placed in a veterinary clinic to get hands on experience with the profession. As I am a person that has always learned best by physically doing tasks rather than just in theory, this sounded like the ideal course for me. What were the reasons for you choosing to come to the UK to study, over studying in your home country? After deciding that I wished to study outside of Norway, the UK was my first choice as I have heard so many good things about their schools and the courses. Even though it would cost me a tremendous amount of money studying in the UK due to the currency and tuition fees, I saw this as an excellent opportunity to see and explore the UK, meet lots of new, interesting people and get a great experience at the same time as studying. First of all I applied for a student loan to cover the tuition fee and as much of the accommodation fee as possible. Also, as I had been working for a few years after I finished school I had therefore saved up some money to fall back on as I knew very well that London is an expensive city and that the student loan would not cover all additional costs and living expenses. Definitely have a healthy supply of money to fall back on as the larger cities in the UK are quite expensive and the student loans will not cover all the tuition, accommodation and additional living/travel expenses. You will not want to have to worry about finances every day as well as all the work and reading required for your course. As this course also required multiple weeks of placement you will not be having as much holiday as other students, therefore you will not be able to go home for as long as they can to save up money as the second placement block continues over the summer. 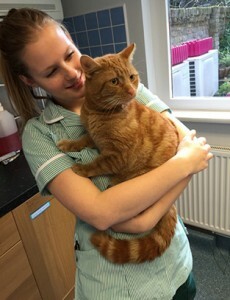 I have always wanted to work with animals, and veterinary nursing has been at the top of that list for as long as I can remember. I wished for a course that would challenge me and give me the practical experience needed to succeed in all aspects of the profession. My impression of The College of Animal Welfare was that they could provide me with the required knowledge and experience to reach this goal, and so far they have not disappointed. The teachers are very good at what they do and you can easily tell that they love their job, something that reflects onto the students working with them. I did a voluntary year of military service in 2009 where I was in charge of the daily routines in their kennels and the exercising of their dogs as well as taking part in the training of the dogs for military purposes. This gave me a different kind of experience with animals that really opened my eyes to how talented they are and what they are capable of. I also worked in a dog kennel over the summer a couple of years later. Additionally, I have also worked for three years as a waitress where I gained a lot of experience in client/guest communication and the importance of teamwork, something that has helped me a lot when it comes to general communication between staff and talking to clients in practice. The veterinary nursing practice module is by far the best part of the course! When you finally get to try out everything you have learned in lectures in practice and get an idea of what it is going to be like when you have graduated. It is a good opportunity to see whether or not this really is something you want to do and it also gives you a lot of experience with animal care and handling. It is a chance to really test yourself and feel how you progress with every task. The workload can be a struggle sometimes, especially during the placement block as you are usually home late in the evenings and you have the nursing progress log to fill out as well as assignments, online lectures or additional tasks to hand in every week. You have to really plan every week to make sure you get everything done in time and that you are on track for exams and assignment deadlines. There are some new acts and legislations regarding animal welfare that I had to become familiar with. Most of it is either the same or very similar to the laws back home, but it is still something you have to know when working in this profession, even as a student. Luckily, this is covered in one of the modules of the first year. There are also some differences regarding the veterinary nurses position in practice, what they can and cannot do, that can take some time getting used to. Although that is where the placement block comes in handy. When I graduate I will be going back to Norway and get a job at a veterinary practice or hospital. I want to work there for a few years while getting more experience and forge some connections within the profession, hopefully at one point becoming a head veterinary nurse and get more responsibility. If the opportunity presents itself, I hope to be able to take some extra courses in nutrition, emergency care and animal behaviour and training. In the future I hope to eventually own a practice, maybe together with a veterinary surgeon. Expect a heavy workload and a full timetable. This is not a course that is going to provide you with plenty of free time and every weekend off to do whatever you like. This programme requires hard work, a lot of time, less holidays and a focused mind. I do not recommend this course unless you are really motivated and ready to sacrifice both time and energy to finish it. In return you get an experience of a lifetime, dedicated teachers and loads of practical experience like no other, all smack in the middle of one of the most amazing cities in the world!